The quest for an Arctic university in Canada has been a long one, and recent strides have made the fundamental objective of this pursuit begin to look like a reality. Exciting times lie ahead for the future of post-secondary education in Canada’s territories, with Yukon College announcing its first three Bachelor’s programs to be granted under its own name, the Government of the Northwest Territories considering recommendations from a report on Aurora College to establish a ‘Northern Canada Polytechnic University’ and Nunavut Arctic College pursuing a partnership agreement with a southern university (Weber, 2018). As Canada is the only circumpolar country to remain without an Arctic university, these activities are significant for Canada’s Arctic stakeholders and the circumpolar community. As the territories and their colleges take significant steps toward the realisation of an Arctic university, this article will reflect on the rationale behind establishing such an institution, the historical pursuit of an Arctic university in Canada, and the three colleges working towards the goal of higher education in the Arctic. The establishment of an Arctic university in Canada is far from a simple task due to the significant social, economic and environmental challenges that Northerners and their communities face. Northern students have experienced several issues over the years, including difficulties in accessing post-secondary programs, restraints because of the limited number of programs offered at northern colleges, and personal challenges (loneliness, homesickness, lack of support, etc.) that arise for students who take the alternative option of moving to study at a southern institution (Rodon & Lévesque, 2014). A university in the Arctic would address some of these issues by reducing costs for Northerners and eliminating the need for students to travel thousands of kilometers from their families to pursue further education (Abele, Courchene, Seidle, & St-Hilaire, 2009; Mackay, 2015; Poelzer, 2009). Furthermore, it has been found that southern universities often lack programs that consider indigenous culture, a northern context and courses that are taught in indigenous languages (Rodonet al., 2014). Developing a Canadian university North of 60 degrees is also about creating sustainable communities and stimulating indigenous self-determination and governance in the region (GNWT, 2007; Yukon College, 2018). As described by Dr Heather Nicol at Polar Research and Policy Initiative’s 3rdHigh-Level Dialogue on SDGs in the Arctic: Canada, there are currently very few educational options, especially for higher education, with southern models of education dominating available educational choices. According to Dr Nicol, a “one size fits all” approach does not work with sustainability, and to achieve sustainability in northern communities, education that serves the needs of communities to pursue their social or economic desires must be established. Higher education must also reflect the cultural needs of northern communities as this is essential for the survival of northern cultural heritage. For Arctic stakeholders, the establishment of an Arctic university in Canada would better facilitate the educational needs of northern communities, create a space for northern leaders and scholars to work together, and expand the scope of a post-secondary education beyond the direct needs of the labour force (Rodonet al., 2014). The establishment of an Arctic university would increase the direct benefits of economic opportunities to communities and help to reduce ‘brain-drain’ in the region. Various researchers have argued that by integrating cultural values into post-secondary education programs and promoting northern research that better reflects the needs of Northerners, there can be greater inclusion and preservation of indigenous languages, further integration of traditional knowledge in northern research, and a dismissal of the colonial heritage left by the imposition of the residential school system in Canada’s North (Abele, Courchene, Seidle, & St-Hilaire, 2009; Mackay, 2015; Poelzer, 2009; Rodon, 2013). Additionally, it is believed that an Arctic university could attract students and researchers to the North to complete their studies and research due to the region’s unique characteristics. If there is any doubt about the benefits of a northern university to the overall development of northern society, much can be learned by observing the benefits that Arctic universities in other Arctic states, such as Ilisimatusarfik (University of Greenland), Greenland, and the University of Lapland, Finland, have brought to their communities, countries, and to the circumpolar society as a whole (Mackay, 2015; Simon, 2017). For over fifty years, a wide range of educators, politicians, community leaders and indigenous groups have been calling for new post-secondary education opportunities in Canada’s North (Graham, 2015; Rodon, 2013; Poelzer, 2009). The quest for higher education in the region has gone through various phases in its history, distinguished by the evolving expectations and rationales for the establishment of a northern university (Graham, 2015). This history has been made up of intermittent efforts to establish higher education and research institutes in the North, both for the purposes and benefit of northern society and southern universities (Graham, 2015; Adams, 2007). Since the 1960s, hundreds of post-secondary academic, vocational/technical, and cultural-linguistic courses and programs have been offered across the North by the network of Arctic community colleges, by government departments, non-profit organizations, and industry associations (Rodonet al., 2014). Most of these programs, however, reflected the short-term labour force needs in the resource development and government sectors of their time (Rodonet al., 2014). A number of challenges have been experienced throughout the pursuit, most of which have been underscored by geographical challenges, the financial expense of the initiative, and ethical concerns regarding the damaging colonial experiences faced by northern indigenous peoples. While early attempts in the 1960s and 1970s to establish a southern institutional model may have failed (the University of Canada North), the lessons learned in the pursuit of an Arctic university showed that community colleges would be more ideal for meeting the varied demands of northern society at that time (Graham, 2015). The 1980s witnessed the community college approach become the primary solution with the establishment of Yukon College in 1983 and the multi-campus Arctic College in 1984. In 1995, Arctic College split into Aurora College for the NWT and Nunavut Arctic College for Nunavut. The colleges have successfully met the demand for college diplomas relevant to northern society, have offered various professional and master’s degree programs in partnership with southern institutions, and in 1990 were accepted into the Association of Canadian Universities for Northern Studies (Graham, 2015). Further, with the establishment of the University of the Arctic (UArctic) in 2001, of which Aurora College and Yukon College are founding members, the colleges have been able to expand their reach throughout the circumpolar community by contributing to and by offering undergraduate courses through the UArctic network. UArctic has also, however, accentuated the lack of an Arctic university in Canada (Graham, 2015). The present-day conception of a northern university in Canada’s territories has been gaining momentum since the release of A Northern Vision: A Stronger North and a Better Canada in 2007 (see Yukon, Northwest Territories, and Nunavut, 2007). The pan-territorial report acknowledged the importance of training and education in building sustainable communities, and this has been reaffirmed in other territorial reports and documents. In 2011, with the purpose of expressing their mutual interests, goals, and commitments to establish a northern university, the three territorial governments signed a Memorandum of Understanding to further explore university models (GNWT, 2011). Jackson Lafferty, Minister of Education, Culture, and Employment for the GNWT, commented at the time that “it is the next logical step in the evolution of our post-secondary institutions and will enhance the learning environment for Northerners by providing quality post-secondary education close to home, where family and community supports are available” (GNWT, 2011). In Mary Simon’s A new Shared Arctic Leadership Model (2017), Simon’s recommendations included establishing education as the cornerstone of the Government of Canada’s Arctic Policy Framework and creating a University of the Canadian Arctic. The groundwork for these recommendations has already been laid in many respects due to the history of attempting to establish a Canadian Arctic university, as well as the significant efforts of Canada’s Arctic colleges to create post-secondary educational pathways and connections with southern universities (University of Toronto, 2017; Simon, 2017). All three of Canada’s Arctic colleges have been working to expand their program offerings, with the primary goal of meeting the growing educational and cultural desires of Northerners. Yukon College, Aurora College (Northwest Territories) and Nunavut Arctic College have all been actively building partnerships with universities throughout the circumpolar community and South of the Arctic Circle in order to expand program offerings, facilitate research being completed in the North, and participate in thematic research/education networks through the University of the Arctic. The momentum behind establishing a northern university in Canada is continuing to grow and Yukon College’s recent announcement on the establishment of YukonU is a sign of significant progress. As each of the three colleges offer a variety of programs and are at different stages in their development, we will establish a baseline of where each college is at in their quest so that we can continue to revisit as each college progresses. 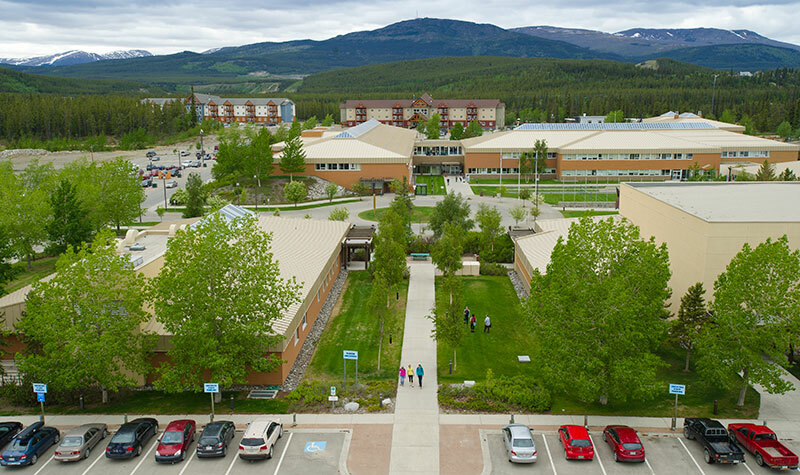 Once a vocational school, now a college, and soon to be a university, Yukon College has become a mainstay in northern post-secondary education. In partnership with the Government of Yukon and the territory’s indigenous peoples, Yukon College has been exploring opportunities to strengthen and diversify Yukon’s economy by producing locally educated and skilled graduates. Yukon College currently offers approximately 50 programs that include academic, professional, trades, and college/university preparation (Yukon College, 2018). With the announcement of Yukon College’s first three bachelor’s programs, Yukon University (YukonU) is now becoming a reality. Yukon College recently announced that it will become YukonU in the spring of 2020. YukonU will be a ‘hybrid university’ – an institution that offers diplomas, certificates, trades, degrees, and continuing education (Yukon College, 2018). The bachelor of arts in Indigenous Governance, the first of the three announced programs, is set to begin September 2018 and “reflects the importance of Indigenous self-determination and governance” (Yukon College, 2018). A bachelor of business administration is anticipated to begin in 2019 and a bachelor of arts in northern studies is anticipated for 2021 (Yukon College, 2018). Further details can be found at www.yukonuniversity.ca. Aurora College is a public college in the Northwest Territories whose mandate is to deliver adult and post-secondary programs to meet the needs of northern individuals, communities and the labour market (Aurora College, 2018). Aurora College is “focused on student success and is committed to supporting the development of our Northern society through excellence in education, training and research that is culturally sensitive and responsive to the people we serve” (Aurora College, 2018). The Aurora Research Institute is the research division of the college and has three research offices throughout the territory (Aurora Research Institute, 2018). The Institute manages research in the territory, offers research licensing and provides research assistance in the NWT. The college, along with its research institute, have served as important education and research institutions throughout the territory. The Aurora College Foundational Review, released in May of 2018, provided 67 recommendations on the future of post-secondary education in the NWT (see MNP, 2018). Its overarching recommendation is that Aurora College should be transformed into the ‘Northern Canada Polytechnic University’ and has provided a vision and pathway to complete the transition in six to eight years (MNP, 2018). The report makes the case that a polytechnic university would assist in engaging the NWT’s population in ‘lifelong, integrated learning’ (MNP, 2018, p. 5). The 143-page document and the future of Aurora College is currently being considered by the Government of the Northwest Territories. Nunavut Arctic College has five campuses throughout the territory and Community Learning Centres located across all 25 communities. The college is celebrating its 30thanniversary of its Environmental Technology Diploma Program in 2018. The College is focused on developing programs and creating research opportunities “in the North, by the North, for the North” (Arctic College, 2018). The College provides programs in health and wellness, education, business, law, arts, culture, and trades and technology (Arctic College (b), 2018). The Nunavut Research Institute coordinates all scientific research across the territory. Due to the fact that Nunavut cannot currently meet the criteria to establish a standalone university, Nunavut Arctic College is pursuing partnerships with southern institutions (Sponagle, 2016). Through an independent study, the College has identified 10 universities across Canada to potentially create a joint-venture or partnership with. The College has created partnerships of various natures with the University of Saskatchewan, the University of Winnipeg, the University of Regina, Dalhousie University, University of Prince Edward Island, Algonquin College and is negotiating partnerships with additional institutions including McGill University, Carleton University, and Memorial University (LeTourneau, 2018; University of Toronto, 2017). Though the College has increased its offerings through these partnerships, there are some who hope to one day see an Inuit-led university in Nunavut (LeTourneau, 2018). Post-secondary education in Canada’s Arctic has been progressing since its inception and the motivation of Canada’s northern communities to build institutions in their image will continue to drive the process forward. The momentum behind establishing a university in Canada’s Arctic is at an all-time high and the progress being made is promising. PRPI will be following as the quest continues and will be following the progress being made by each of the three colleges to provide higher education in Canada’s North. Abele, F., Courchene, T. J., Seidle, F.L., and St-Hilaire, F. (2009). The New Northern Policy Universe. In Seidle, F., Abele, F., and Courchene, T. (Eds.) Northern Exposure: Peoples, Powers and Prospects in Canada’s North. Institute for Research on Public Policy. Adams, P. (2007). Trent, McGill, and the North: A story of Canada’s growth as a sovereign polar nation. Toronto: Cover to Cover Publication Services. Graham, A. (2015). The University Project in the Canadian North, 1964 – 2014. Historical Studies in Education / Revue d’histoire de l’éducation, 27 (1). 80 – 98. Poelzer, Greg. 2009. Education: A Critical Foundation for a Sustainable North. In Seidle, F., Abele, F., and Courchene, T. (Eds.) Northern Exposure: Peoples, Powers and Prospects in Canada’s North. Institute for Research on Public Policy. Justin Barnes is a Fellow at Polar Research and Policy Initiative. He is also an MA candidate in the Sustainability Studies program at Trent University’s School of the Environment where his research is focusing on the sustainable development of Canada’s coastal communities on the Arctic Ocean. As part of this research, Justin is currently exploring the concept of environmental security, the role this form of security plays in shaping social, economic, and environmental policies, and its influence on resource and infrastructure development in the Arctic. Justin is also actively involved in the sport of Sailing and represented Canada internationally on the World Sailing circuit as an athlete on the Canadian Sailing Team for five years (2013 – 2018).